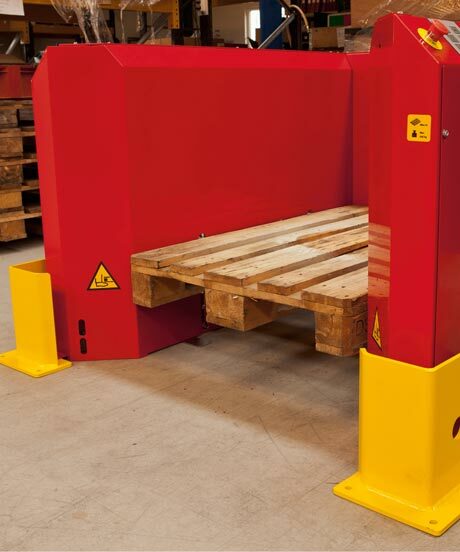 The pallet magazine/ pallet dispenser PALOMAT 5 - which is a part of our Stand Alone line - is ideal for stacking and destacling multiple pallets simultaneously. You insert or remove the 1-5 pallets at a time using a hand pallet truck, electric stacker or forklift truck. All pallet handling is carried out at floor level. The PALOMAT 5 should be activated manually each time it is to perform a function; with just a tap on the reset- and next the start button the PALOMAT performs the stacking or destacking function. The PALOMAT 5 figures out itself if it should stack or destack. Handles 15 to 25 pallets. If, for example, you wish to remove 3 pallets from PALOMAT 5, you will simply indicate this by selecting “3” on the adjustment knob and by pushing the reset- and next the start button. During stacking, the PALOMAT 5 is always ready to receive 1-5 pallets. The pallet magazine/ pallet dispenser PALOMAT 5 includes a maximum indicator for 15 or 25 pallets, which is integrated in the PALOMAT. When 15/ 25 pallets are loaded, the PALOMAT destacks the entire stack. The PALOMAT can handle all 4-way pallets in wood, plastic and metal no matter what the length, width or height. We can customise the PALOMAT 5 to exactly match the pallet size you use. Contact the PALOMAT sales department or the nearest PALOMAT dealer for further information. As the PALOMAT is equipped with various sensors, wires and pipes, cleaning must only be carried out with a weak alkaline cleaning agent. The PALOMAT must not be flushed, but only wiped with a damp cloth. A signal tower including a Sick sensor that detects when the pallet stack is full. If the PALOMAT® needs to stop e.g. 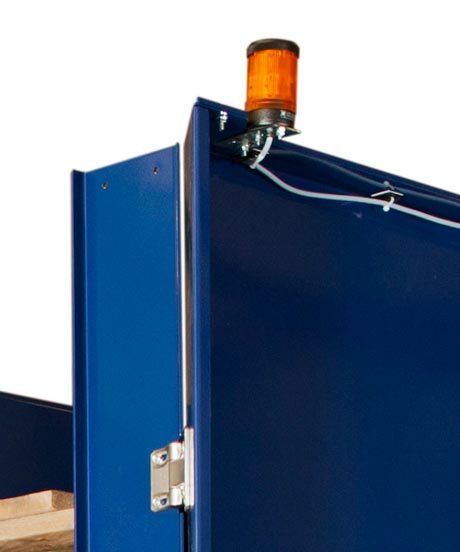 at 15 pallets, the signal tower with a maximum indicator can be mounted on the safety frame or on a bar. When the maximum indicator is actuated, e.g. at 15 pallets, the lamp lights and the stack is automatically put down on the floor. The stack is then ready for pick-up, e.g. by a hand pallet truck. The truck protection is produced in 10 mm steel and can be offered as an extra protection of the front sensors. 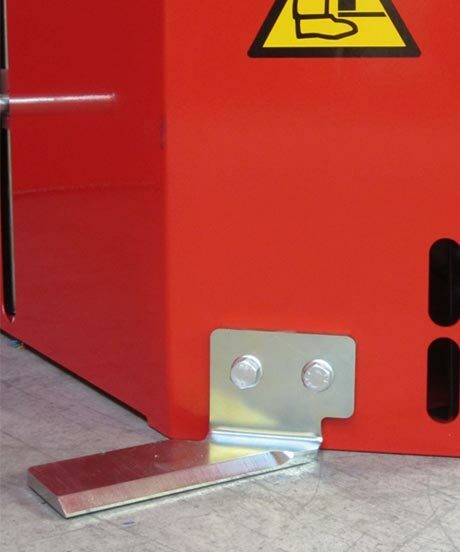 The truck protection is two separate parts, which are mounted into the floor in front of the PALOMAT®. The solution is used especially by companies, which handle pallets by forklifts. The stop blocks are a perfect option when the PALOMAT® needs to handle pallets where the runners at the bottom are crosswise to the hand pallet truck. When pulling out the hand pallet truck from the PALOMAT®, the two stop blocks hold the pallet in place, keeping it in the magazine. The stop blocks are installed at the front of the PALOMAT®, one on each side next to the front sensors. 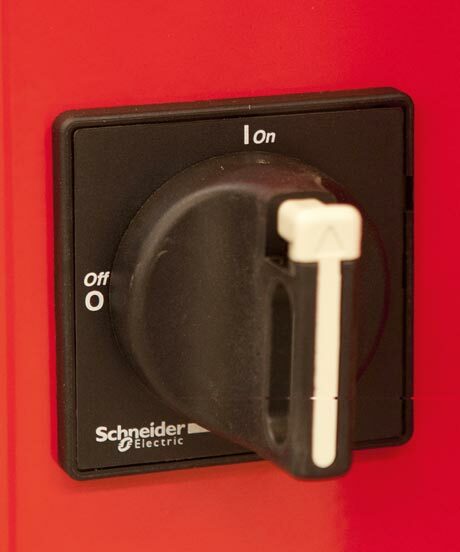 The switch disconnector enables disconnection from the main supply right on the machine. The switch disconnector can be locked, e.g. when servicing the machine. This is an advantage and a safety feature for maintenance of the PALOMAT® unit. The switch disconnector is positioned under the main supply. 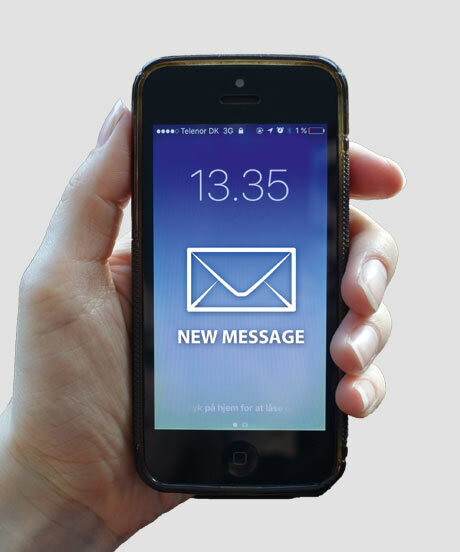 An interface sends an e-mail or SMS to the responsible for the PALOMAT®, e.g. when the magasin is empty or when there is an error with the PALOMAT®. It is installed with a mobile data sim-card (delivered by the customer) or a patchcabel, which is connected to the company’s network.